The other day I appeared on “Connections,” a news radio show which airs on WXXI in Rochester, New York, an NPR-affiliate. I participated in a panel discussion about how the Declaration of Independence is taught in classrooms and how much Americans know about this important document. The precipitating event that spurred this discussion was the decision by NPR to tweet out on Independence Day the entire Declaration, 140 characters at a time. Some of NPR’s Twitter followers applauded this decision, but a group of Donald Trump supporters saw something subversive at work. Unaware of what they were reading, and in some sense living up to negative stereotypes about Trump voters, they accused NPR of tweeting out Anti-Trump propaganda. The national media picked up on the story, concluding that large numbers of Americans know little about the founding of their country. I spent the Fourth of July with my family camping in the Adirondacks. There were plenty of American flags flying from trailers and boats in the campground, and a noticeably large number of campers wearing T-shirts containing passages from the familiar opening lines of the Declaration. We stuck to ourselves, and stayed away from the Fireworks display in Saranac Lake, about 15 miles away. We just were not feeling it this year. We took a too-long canoe journey, and went to the beach, and avoided powerboat exhaust, so I never had an opportunity to speak to any of the people wearing these shirts. It is not difficult to imagine that they saw in the Declaration’s language something of great significance. But what? And what did those words mean to them? 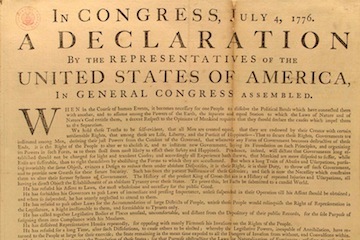 To a great extent, these were the issues that we discussed on “Connections.” The Declaration of Independence, many Americans very clearly believe, is important and a source of this country’s highest ideals. Liberals and conservatives share an appreciation of its importance, even if they disagree about the extent to which the United States has lived up to those ideals. But very clearly, Americans also know little about the document itself, the indictments it contains against the conduct of the king that American patriots felt justified rebellion, and the specific context from which it emerged. Much of what they think they know is either wrong or extraordinarily simplistic. One of my fellow panelists, for instance, pointed out that “we” came to America for freedom. Of course there were many people already here when those freedom-seeking colonists came stumbling ashore, and by a three-to-one margin, between 1630 and 1780, the movement of peoples across the Atlantic to English America was much more black than white. The vast majority of people who crossed the Atlantic came as bond servants or slaves. And, from the English perspective, these colonies existed to serve the crown. This factor alone, which I described in my first book, is important to remember. Colonial promoters wanted to profit from their overseas enterprise, they wanted to secure a foothold on American shores, and spread what they believed was the one and only true religion. The Declaration, furthermore, contains in its indictments of the Crown a number of “ideals” that when examined more closely, reveal some of the darkness that lay at the heart of the founding. The committee that drafted the Declaration, for instance, denounced the Quebec Act, a piece of legislation usually treated as one of the so-called “Intolerable Acts” but that may, in fact, have helped Quebec avoid the blood-stained history of Northern Ireland. That the rebellious colonists opposed the Quebec Act makes quite clear that one of the American republic’s founding ideals was Anti-Catholicism. Similarly, the colonists condemned George III for messing around with immigration and naturalization. One of my fellow panelists likened this to Donald Trump’s attempt to ban Muslim immigrants from a handful of countries. But if one thinks of Warren Hofstra’s great article that appeared in the Journal of American History in 1998, the Empire saw strategic immigration as a way to bolster frontier defense. Thus when Jefferson wrote in the Declaration that the King “has endeavoured to prevent the population of these States; for that purpose obstructing the Laws for Naturalization of Foreigners; refusing to pass others to encourage their migrations hither, and raising the conditions of new Appropriations of Lands” they were complaining in part about limits on their efforts to discriminate against outsiders coming to the colonies and the crown’s efforts to keep colonists off of Indian lands. Most Americans, I suspect, poorly understand that the Declaration came after fifteen months of war, and that without the violence of the Revolution, the document itself would have become just another forgotten manifesto from a failed revolt. They fail to recognize that many politically literate Englishmen would have found little in the Declaration’s memorable preamble with which they might disagree, and that what we see as a glorious statement of American ideals, after all, was influenced by the English political writing Jefferson and others had been drinking in for a generation. (Though they would not have accepted the notion that the “usurpations” and “injuries” inflicted on the colonists by the king justified armed rebellion against the duly constituted authorities of the imperial state.) They seem unfamiliar with the notion that the Constitution of 1787, rather than serving as the successful culmination of the Revolution, was a deeply flawed document that may, in the view of some historians, have served as a conservative counter to the radicalism of the American Revolution. Woody Holton’s excellent work will make that point abundantly clear. The biggest flaw in that document, its protection of the institution of slavery and southern control of the union, required a war that killed more than 600,000 Americans, lasted five years, and has left a legacy with which we still struggle. That is more than a mere hiccup in a story of American progress. The birth of the American nation can be neither understood nor explained without reference to the enslavement of Africans and the dispossession of native peoples. These Americans might be surprised that Great Britain abolished slavery well before the United States. I have written on this blog in the past about Americans’ lack of civic knowledge. But the point was made abundantly clear with the evidence presented by the show’s talented host Evan Dawson that immigrants to the United States do considerably better on the citizenship exam than do native-born American citizens–and some of those citizenship questions are stunningly simple. “1. Name ONE American Indian tribe in the United States. SMH, as the kids say. What is clear is that we can and must do much, much, better in teaching this nation’s history, and that we must push back against the homogenizing forces in American education (those on the right who denounce a rich depiction of American history with the intellectually-bankrupt epithet “politically correct” or those who emphasize STEM to the detriment of everything else, to state legislatures that slash school budgets and attempt to micro-manage talented teachers). There is, clearly, so much at stake. An ill-informed public, not willing or able to exercise its critical citizenship, will make a fit tool for tyrants. Frederick Douglass long ago saw in the commemoration of Independence Day evidence of America’s considerable hypocrisy. The nation had not lived up to its ideals, he claimed. As recent events have demonstrated–the continued killing of peoples of color by police officers, grinding and increasing inequality, a government attuned to the interests of the most wealthy among us and tone-deaf to the growing numbers at the bottom–we have a long, long, way to go.